David Bowie, one of the most influential rock musicians of the last fifty years, passed away on January 10th at the age of 69. His death came just two days after the release of Blackstar, his 25th album. Bowie’s creative peak as a rock’n’roll star came in the 1970s with the release of five albums from 1972-1975. These LP’s were in order The Rise and Fall of Ziggy Stardust and the Spiders from Mars, Aladdin Sane, Pin Ups, Diamond Dogs, and Young Americans; they garnered instant stardom for the budding performer and forever changed the landscape of popular music. Born and raised in Brixton (south London), David Robert Jones (he changed his name to Bowie in the 1960s to avoid confusion with Davy Jones of the Monkees), took a career path that included dabbling in art and design. But as a youngster, Bowie demonstrated a proclivity for mastering a wide range of instruments and soon started to form bands. He played the alto saxophone, ukulele, chest bass, and piano, organizing the Konrads followed by the King Bees, the Buzz, etc. Early influences abounded and centered on Little Richard and Elvis Presley. After hearing “Tutti Frutti, Bowie exclaimed “I had heard God,”; “Hound Dog” caused him to start buying records. Bowie labored long and hard before emerging as a world renowned superstar. Released on July 11, 1969 (five days before the launching of Apollo 11), “Space Oddity” made it into the top five in the United Kingdom. The Man Who Sold the World (1970) and The Rise and Fall of Ziggy Stardust and the Spiders from Mars (1972) ensued with accompanying hysteria, chaos, and confusion. Bowie’s brainchild, Ziggy Stardust combined elements of the persona and music of Lou Reed and Iggy Pop, producing what biographer Christopher Sandford called “the ultimate pop idol.” Androgynous in appearance to begin with, he wore a dress onstage, utilized makeup extensively, and dyed his hair reddish-brown. Ziggy Stardust lasted only two years with the by now rock god opting to retire the character at London’s Hammersmith Odeon on July 3, 1973. Bowie moved to Switzerland and then eventually to Germany in the late 1970s. In that country’s capital city he experienced an extended period of creativity leading to a revived interest in painting, the enjoyment of classical literature and music, and the production of three albums dubbed the “Berlin Trilogy.” Low, Heroes, and Lodger, all released during the 1977-1979 period, bore the influence of the German rock groups Kraftwerk and Neu! That is, lyrics became sparser in nature and electronica took over as the guiding force behind everything. The critical reception for these records could best be characterized as lukewarm. The 1980s and the years afterwards witnessed Bowie becoming involved in the making of new music in an increasingly sporadic fashion. In 1981 he teamed up with Queen for the one-off single release “Under Pressure.” The song proved to be a hit, rocketing up to number one in the UK. Two years later Let’s Dance (co-produced by Chic’s Nile Rodgers) came out and spawned three hit singles—the title cut, “Modern Love,” and “China Girl.” Bowie duetted with Mick Jagger on “Dancing in the Street” in 1985; the single quickly went to number one upon its release. Tin Machine, a hard-rocking quartet, represented Bowie’s misguided effort to capitalize upon the public’s demand for music with a more pronounced sonic edge. He scrapped plans for a second album with the group and returned to performing his early songs during the seven-month Sound+Vision Tour in 1991. Honors Bowie received during this period included induction into the Rock and Roll Hall of Fame in 1996 and a Grammy Lifetime Achievement Award in 2006. His final two albums, The Next Day and Blackstar were released in 2013 and 2016 respectively. They both got glowing reviews from the critics and proved to be hits with the record-buying public. “Where Are We Now?” from The Next Day debuted in the UK Singles Chart at No. 6, while sales of Blackstar have gone off the charts with Bowie’s death. Bowie appeared in a number of movies throughout his primary career as a musician. Bowie’s first major role in a film came in The Man Who Fell to Earth (1976); he garnered perhaps the most complimentary reviews of the entire time he spent in cinema. The Hunger (1983) featured him in a revisionist vampire film with Catherine Deneuve and Susan Sarandon, Merry Christmas, Mr. Lawrence (1983) saw the singer portraying a prisoner of war in a Japanese internment camp, The Last Temptation of Christ (1988) had as one of its highlights Bowie playing the role of Pontius Pilate in Martin Scorsese’s controversial cinematic endeavor, and The Prestige (2006), one of Christopher Nolan’s first films, included the rocker giving a solid effort as physicist Nikola Tesla. The personal life of Bowie was dominated by two lengthy marriages. He married Mary Angela Barnett on March 19, 1970; he divorced her ten years later. On April 24, 1992, Bowie married Somali-American model Iman in a private ceremony in Lausanne, Switzerland. She clearly was the love of his life; he has famously asserted that it was love at first sight for him when he looked into her eyes. Bowie had one child by each marriage; Duncan, a son, by his first wife and Alexandria “Lexi” Zahra Jones, a daughter, by Iman. 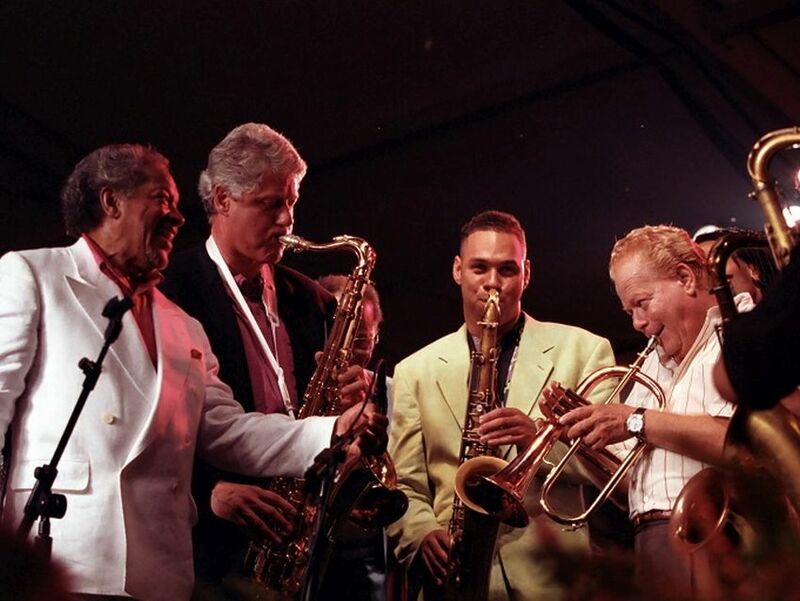 There are three photos concerning President Clinton and David Bowie. 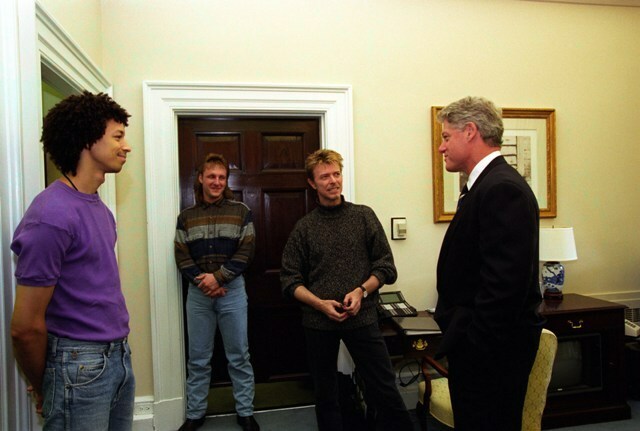 The event pictured here took place on October 6, 1995, when Bowie and members of his band visited the President in the Outer Oval Office. 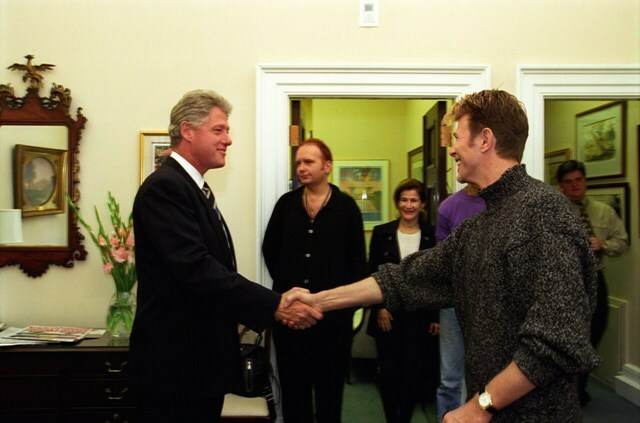 The first photo shows Clinton and Bowie shaking hands; the second photo shows Clinton and Bowie engaged in conversation while the other two people present (members of Bowie’s band) watch. 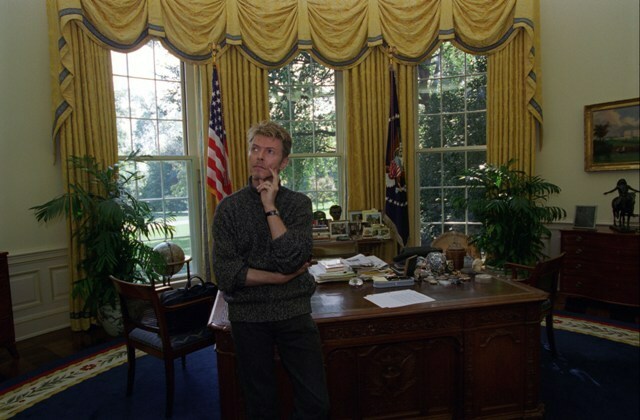 The third and final photo finds Bowie by himself in the Oval Office engaged in wistful contemplation.